Home + News + Spill Containment – Is Your Workplace Prepared? Spill Containment – Is Your Workplace Prepared? Any workplace using chemicals or oils has the potential for a spill. These occur when a product escapes from its primary container, which could be anything from a 55-gallon drum to an IBC or even a bottle. Secondary spill containment helps prevent spills, injuries to workers, and damage to the environment. Most spills take place while dispensing product or moving a primary container. Dispensing valves can fail, or someone may not close the valve in time. In a rush, workers may remove a receiving container before the product stops flowing. Bumps when moving containers may cause the primary container to fail. Despite our best efforts, spills still happen. 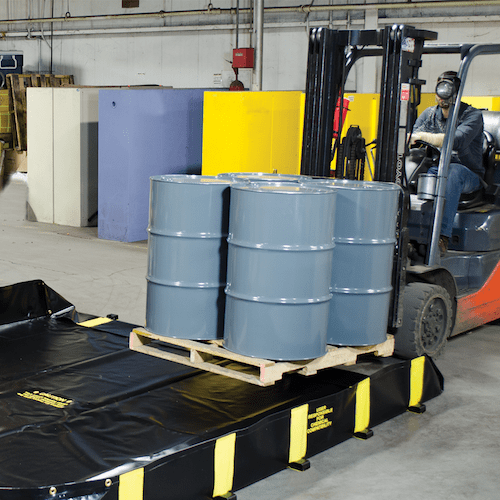 Read on for some best practices for spill containment. Secondary containment must contain the entire contents of the largest container or 10 percent of the total volume stored, whichever is greater. Justrite supplies drum caddies to keep drums horizontal when moving and dispensing. They feature built-in spill containment that catches drips from the dispensing valve. 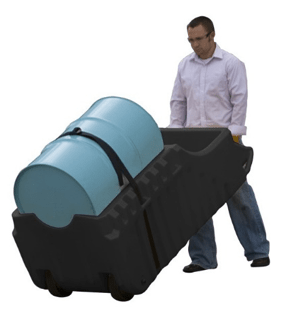 Store 55-gallon drums upright with spill control pallets. Product often spills when pumped from vertical drums. An oversized sump beneath provides containment. 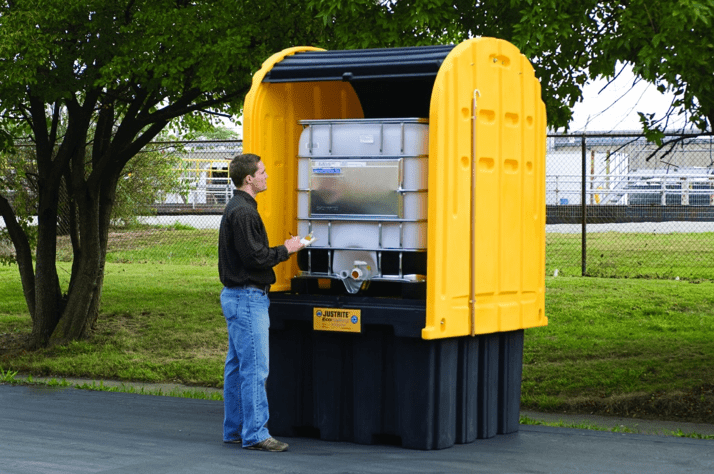 Use for spill centers, waste collection sites, or routine storage. An optional companion ramp is also available. Built-in sumps meet the requirements for storing drums or intermediate bulk containers (IBCs). Covered roofs prevent the ingress of rain or snow so that you do not need to enlarge your sump capacity for runoff. Justrite EcoPolyBlend™ IBC Stations store IBCs in a compact footprint with an ergonomic working height. The outdoor design features lockable, dual-access roll-top doors. Use durable and weather-resistant drum sheds for compliant outdoor storage of 30- and 50-gallon drums. Convenient roll-top doors provide access from the front or the rear. Durable PVC fabric resists chemical attack. Fold down and store compactly for easy portability, emergency use, or even longer-term storage. Justrite Rigid-Lock QuickBerms® are easy to set up, with no assembly required. Use for drive-through, emergency, decontamination or preventative applications. The patented Rigid-Lock wall support system ensures the walls stay in a 90-degree locked position. Compact and portable, maintenance spill berms deploy instantly for quick and easy spill containment. Encased urethane foam sidewalls allow roll through access for drum placement, without the need for a ramp. The walls spring back into place with no memory loss. Spills can happen at anytime and anywhere. Proper spill containment at your facility can prevent injuries, environmental incidents and costly fines. Browse our complete range of Justrite spill containment products here.